Telling the truth shouldn't be controversial. Especially when it's as plain as the rain and as simple as the snow. For many television meteorologists, though, telling the truth about how climate change affects our weather can bring real backlash from deniers. But still they keep at it, bravely bringing the truth to millions of Americans every day. We think it's time to give them a high-five and say, "Thank you." 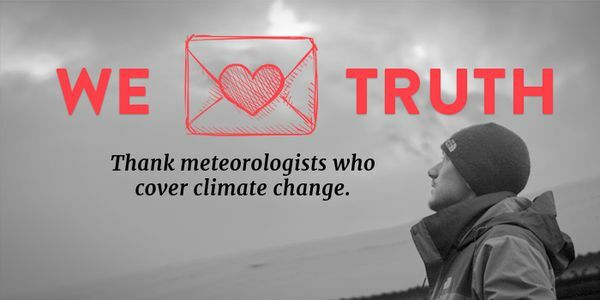 Here at Climate Reality, we put together a list of 21 weather forecasters who are making the connections between weather and our changing climate to people across the country. Give these meteorologists a little love and thank them for standing up and telling it how it is. Sign on to the letter below. Thank you for covering the climate crisis on-air! When meteorologists like you make the connections between weather and climate, you help Americans understand the truth of what&apos;s happening to our planet. I know that speaking out about climate change can sometimes mean getting negative or angry feedback. But thanks to brave voices like you, more and more Americans see the reality of the crisis and want real action to solve it. Thank you again for speaking up. I hope that you continue to make the connection between climate change and the weather we see today clear in future broadcasts.